Next, plug your results into Google AdWords Keyword Planner to see what the search volume is for different words. Since you can target by geography you are able to get highly relevant search numbers. The Keyword Planner lets you export your results, giving you a spreadsheet that clearly shows you which words and phrases rank highest (and lowest) in terms of search volume. Armed with this information, you now know what words you should be including in your website and it’s time to start writing and/or revising your copy. A title tag is a concise 60-70 character description of the content on a particular website page, and the meta description is a more detailed summary – about 150-160 characters. Think of them as your elevator pitch for the website page. Their purpose is to explain what information the page contains, and entice the user to click through. The two combined are what you see on search engine result pages. 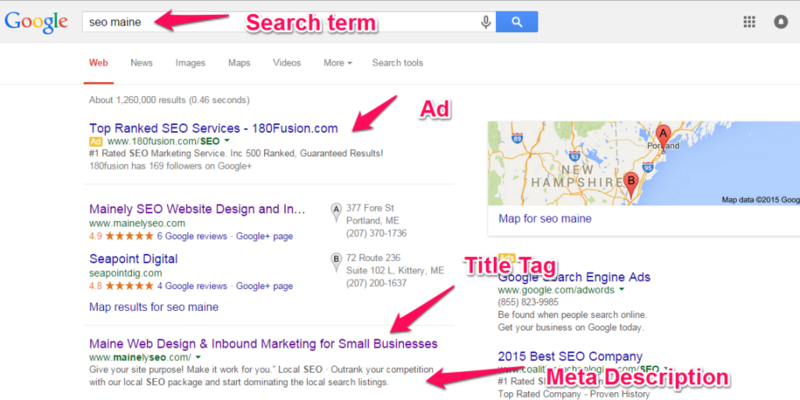 One common mistake businesses make is using the same title tag and meta description for each web page. This gives search engines the false impression that your website is actually only one page which lowers your perceived value with the engines, making it harder for your site to rank very high, which in turn makes it difficult for potential customers to find you. Remember, title tags and meta descriptions are fairly short. Rather than guess or count characters, one easy tool we like to use is SEOmofo. It makes writing titles and descriptions a snap by visually showing you exactly what your information will look like when displayed in a search result. What Should You Include in a Title Tag? You want each title tag to be unique for that particular page. The more relevant the title, the more likely search engines and customers will find you. The ideal title tag format includes your most important key words first, followed by any other relevant key words. Yes, it is your website’s home page, but that doesn’t really give any useful information to the search engines or the user, as it doesn’t contain your company’s name, your services or location. Plus, it is unlikely to display in search results. Now on to the meta description. This is where you have a little more room to describe the information contained on the page. We want to include many of those same initial key words, as well as other words and phrases we know customers will be searching for. In this case, we are going to list some of Party World’s most-rented party items, as this is what potential customers are most likely to type into a search engine. Party World in Portland, Maine, specializes in rentals for parties and events – everything from event staff to tables, tents, bounce houses and more! This description contains many of our original key words, but also includes “parties,” which is another search term users are likely to use, as well as our top rental items: tables, tents and bounce houses. We are big fans of creating websites with WordPress, which makes adding your tags and descriptions a snap with the free Yoast plug in. Simply install the plug in, then add your title tags and meta descriptions for each individual web page. If you are interested in optimizing your site for search engines but lack the time or technical expertise to do it yourself, contact the experts at Mainely SEO. We offer free initial consultations and can discuss the many ways we can help your customers find you online.